It is our intent to provide a Premium Quality Wood Product, unique to each customer’s living environment, with emphasis on personal ( individual) customer care. If you are an Architect, General Contractor, Designer, or Home Owner, our selection of domestic and imported woods along with our countless door styles and custom finishes will provide you hundreds of options to fit your needs. Nerstrand Custom Cabinets takes pride in the ability to reproduce styles and finishes to match and blend with existing pieces in your home. Cabinet interiors are available in melamine finishes, plywood’s, and plastic laminate. New sustainable forestry products are available in some materials as well as formaldehyde free cores. You have many choices in drawer slides, weather you need heavy duty, full extension, soft close, and standard or specialty items. We also provide decorative hardware and hinges. 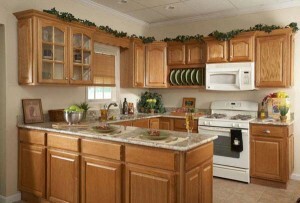 Along with custom cabinets we offer a great selection of KraftMaid and Merillat cabinetry. Counter Tops are an important part of finishing your project and we offer a great selection of colors in, Granite, Quartz, Solid Surface and Plastic Laminates. Nerstrand Custom Cabinets has quality cabinetry to fit every price range and life style.